Only slightly smaller than the U.S. state of West Virginia, Costa Rica is blessed with mountains and meadows, beaches and islands, rainforests and cloud forests. There is a lot to explore, and one of the best ways to do it is with a rental car. Renting a car gives you the freedom to stop where you want, when you want. You can take side trips along rural roads or stop to enjoy fresh fruit at a local farmers market. With a rental car, your trip is literally in the palm of your hands—and you can steer yourself in whatever direction (and to whichever adventure) that you choose. This guide is intended to provide travelers with helpful, up-to-date information on what it’s like to rent and drive a car in Costa Rica. There is a wealth of information out there and we’ve boiled down the most important and relevant points. We’ll go over the rental process and advise you about what to rent, and cover the upsides and downsides of driving in Costa Rica. Some of the benefits of having your own wheels are obvious: you can dictate the course of your day, your week or your whole trip, and not be confined to shuttle times or bus schedules. Having a car will allow you to explore lesser-visited places that many tourists miss and will give you the freedom to change your plans if something comes up. And who doesn’t like controlling the radio on a road trip? However, driving in Costa Rica is no piece of cake. The roads can be long, curvy and in poor shape. Traffic can be bad in cities or on mountainous roads, and signs are sometimes non-existent. It can be easy to get lost (especially if you don’t have GPS or high-quality maps) and is tough to get back on track if you aren’t comfortable handling directions from a local speaking Spanish. There are other things to consider as well, including traffic laws, the price of gasoline, and driving time. Renting a car is usually not recommended for first-time visitors to Costa Rica—the hassle and potential for confusion is usually not worth the effort. To better enjoy your vacation, we recommend booking private transport to save time and travel more efficiently. However, travelers that are adventurous enough or have been to the country before may want to consider renting a car. If you’re still on board, keep reading. Booking your rental car through Anywhere Costa Rica is simple and painless. Just enter your pick up/drop off dates and times, pick up/drop off locations, and vehicle type, and voilà, you have a list of cars to choose from. You can compare brands and models, as well as rental agencies and costs. It’s quick, easy and efficient. You can also book cars through an Anywhere agent. Our agents can be reached via phone, email or chat and are here to give you helpful, personalized assistance with the rental process. The type of car you choose depends on what you plan to do during your trip. If you’re going to be driving in the mountains, along rural roads, or in certain coastal areas, you will want a four-wheel drive vehicle. Consider renting a 4WD car if you will be heading to any of the following places: The Nicoya Peninsula, Monteverde, Rincón de La Vieja, the La Paz Waterfall, Bajos del Toro, the south Pacific, the Osa Peninsula, and many places along the Caribbean coast. Many of these roads have potholes and stream crossings, and require vehicles with large clearance—so it’s nearly impossible to travel these routes without an SUV. There are both compact and full-size SUV options available. Compact SUVs are smaller, have lower clearance, and get better gas mileage. They fit four to five people and come in both two door and four door options. Full-size SUVs are larger and more powerful. They have better ground clearance, a stronger engine, and more interior room. For this reason, they are preferable on very poor roads or when traveling in large groups. Most full-size SUVs have four doors and can seat between four and seven people; they also include trucks. However, due to their high center of gravity, full-size SUVs have a higher chance of tipping—take special caution while driving around corners. If you’re planning on staying along fairly well traveled routes, a compact or full-size car will be fine. Coastal areas in the central and north Pacific are suitable for smaller cars, as are most places between the Caribbean coast and the northern lowlands. The roads surrounding the Arenal Volcano are appropriate for this type of car as well. These cars have two-wheel drive and are not suitable for rough roads. Compact cars are the smallest, most economical option. Oftentimes they are hatchbacks, although many are sedans as well. Full-size cars are larger than compacts. They are typically sedans and have more powerful engines. Appropriately, they get slightly worse gas mileage. Full-size cars are roomier and better for groups with lots of luggage. A final option is vans. Vans are the largest, most spacious vehicle and are great for big groups. Vans should be used in the same areas as a compact or full-size car. Most are two-wheel drive and have very poor off-road capabilities. They typically seat up to twelve people and come in three or four door options. Vans tend to get low gas mileage and like full-size SUVs, have a greater chance of tipping due to their size. All rented cars come with basic features, including air conditioning, power steering, power windows/locks, dual airbags, and a CD player/radio. Manual and automatic options are offered in every category. Rental cars also typically include a safety kit for accidents and flat tires. This includes jumper cables, rope, a flat tire kit, road triangles, and a fire extinguisher. One popular – and much recommended – device to add to your car rental is GPS. Costa Rica’s roads are curvy, complex, and often without real road signs. For this reason, it is very easy to get lost if you don’t have an up-to-date map or GPS device. A GPS unit can save you time and a world of trouble. They can be added to your car for around $10 USD a day and usually require a deposit of around $450 USD. We recommended using the GPS device that the car rental company provides rather than downloading something from the Internet—by doing so, you’ll be privy to new routes or recent changes in roads. Another thing to keep in mind: several places in Costa Rica share the same name, which can get confusing. For this reason, if you already know where you’ll be going (destinations or hotels) when you pick up your car, have the rental agency save the locations into the GPS. This will save you the headache of arriving at the wrong place. A good way to supplement GPS is with the Waze application. Travelers with a smartphone and international data plan can download this community-based traffic and navigation app to get real-time information on road, routes, accidents, traffic jams, construction, and more. Waze does, however, require an Internet connection to initially map out routes and obstacles. For this reason, we recommend using Waze to map your route while still at your hotel or before you start driving—once you no longer have Internet, your routes will still be saved. Some areas of Costa Rica do, however, lack Internet access, so it’s advisable to use Waze as a supplemental navigational system to your car’s GPS. Travelers can also purchase or rent road maps from most car rental offices. Before renting a car, it’s a good idea to read up on the rental policies. That way you won’t get whacked with an unexpected fine or have unrealistic ideas about what the deposit process is like. The following section includes information on insurance, deposits, fines, and rental times. Travelers to Costa Rica need a driver’s license from their home country to rent a car. Tourists are typically allowed to rent a car for up to 90 days. After 90 days, you are required to get a Costa Rican driver’s license. There are also supplemental full coverage insurance options that can be purchased on top of the mandatory insurance. These are more expensive, but cover most situations, have a higher amount of coverage, and may have zero deductible. Many also include 24-hour roadside assistance. Again, the amount you pay depends on the type of vehicle you rent. Before you leave for Costa Rica, read up on your own car insurance policy. First of all, find out whether you are covered abroad. If you are, see if your policy extends to all persons driving the car and how much liability is covered if a third party is injured. Also find out whether the type of car you’ll rent in Costa Rica is covered in your contract. When you rent a car, you will also be required to place a deposit. Generally, this runs from $700 to $1,500 USD and depends on the type of insurance the customer chooses. The rental company puts a hold for this amount on your credit card and releases it when you return the car and GPS device in good, working condition. The deposit is not released immediately, however, but rather requires around 3-4 weeks to be placed back onto your credit card. If an accident does occur, your deposit will be held while your case goes to court. Once a judge has decided the final verdict, your deposit will either be refunded or go towards paying for the car’s damage. There are several conditions that may result in a fine from the rental company. These include returning the car with less fuel than it was initially rented with, returning the car late, or returning the car to a location other than initially agreed upon. Regarding the second point, rental times are defined very rigidly – one day of rental literally means 24 hours. For example, if you rent a car for one day and you pick it up at 8 AM, it must be returned by 8 AM the following day. Failure to do so will result in a fine. If you are fined, you can either pay the amount directly or have it subtracted from your deposit. Driving in Costa Rica is unlike driving in North America or Europe. Within the span of a single day, you can travel along winding mountainous roads, rural gravel paths, or scenic coastal byways. The country’s unique geography – of mountains, volcanoes, valleys, plains, and coasts – has made for a challenging road system. Before you head off on a road trip, think about where you will be going and what you will be driving through. Costa Rican driving conditions can throw you for a loop if you’re not ready. Learning about the road conditions will give you a good idea of what to expect. Costa Rican driving conditions vary from place to place. Around urban areas like San José, there are large, multi-lane freeways with smooth roads. The farther you get from a developed area, however, the poorer the road conditions are likely to be. Due to Costa Rica’s mountainous terrain, many roads are two-lane and windy. They curve up, down, and around mountains. Along roads like these, is not uncommon for large trucks to go very slow and have traffic pile up behind them. For this reason, going a seemingly short distance can take much longer than expected. Some roads lack guardrails and have steep drops along either other side. Others are pockmarked with potholes or have been washed out completely by a landslide. Indeed, the rainy season wreaks havoc on Costa Rica’s roads—landslides, flooding, and erosion are not uncommon. In many rural areas, gravel or dirt roads are the norm. These can be quite rough and may even require stream crossings. For this reason, it’s necessary to have a four-wheel drive vehicle in many parts of the country. Two-lane roads often narrow into single lanes over bridges—in this case, drivers must ceda (yield) to drivers with the right of way. The reflective paint separating lanes or lining the roads can be faded or non-existent, which can make driving dangerous, especially at night. Signs in Costa Rica are equally hit or miss. Along well-traveled tourist routes (for example, in Manuel Antonio), the signs are well positioned, easy to see, and informative. However, in many parts of the country, signs are either lacking or totally absent. It’s easy to get lost, especially without GPS. If you read the previous section, you’ll have a good idea of how difficult driving in Costa Rica can be. The following section will instruct you on the most practical ways to avoid accidents, fines, and frustration. The easiest way to avoid all three things is by using GPS. These devices can be rented for a relatively small fee (around $10 USD a day) when you pick up your car. Most often, the GPS is attached to the dashboard of your car and is easy to see while driving. They are hands-free and will tell you when to turn and what to expect. They can help you plan routes, estimate distances and arrival times, and even locate the nearest gas stations. GPS is undoubtedly necessary for navigating Costa Rica’s road system. As a supplement to GPS, travelers with smartphones and an international data plan can download apps like Waze, which help map roads, routes, accidents, construction, and more. It’s a good way to get a second opinion on where you’re going. It does, however, require Internet access—fire it up and type in your destination before heading leaving your hotel. We also suggest travelers to have physical maps in the car as well. These can be rented or purchased from most car rental agencies. If you do get lost, it will be helpful to know at least a few words of Spanish. You may drive through rural areas where people don’t know much English, so being able to ask for the highway or hotel will be important. Purchase a basic Spanish phrasebook and bring it along with you. Practice your pronunciation in the car for fun. You’ll be happy you did if you end up dead lost in the middle of nowhere. Costa Rica is a tough place to drive in during the day. At night, it’s even worse. Road signs (which are already shoddy in some places) can be difficult to see in the dark—it’s common to pass by the road or hotel you were looking for several times. Roads may also have poor reflectors between the lanes or lining the side of the road, and very often have little room to pass. People sometimes walk near the edge as well, which means you’ll need to exercise even more caution while driving at night. It’s also good to be aware of the availability of emergency services. Outside of San José, both vehicular and medical emergency services can be limited. The closer you are to a sizeable town, the better the chances are of being able to get towing, mechanical, or medical help. Along the Interamerican Highway, this is usually not a problem. Major towns and tourist destinations – like Liberia, Puntarenas, Golfito, Quepos, and Palmar – all have clinics or hospitals. However, in more remote areas, it may be difficult to get your car towed and fixed or get an ambulance to a hospital. If you do have an accident, call the National Insurance Institute (INS) at 800/800-8000, as well as the Transit Police at 2222-9330 or 2222-9245. You can also call 911 and get redirected to whatever agency you need. If there is a police officer nearby, they will show up and make a report, which will help facilitate your insurance claim. Officers can sometimes be unhelpful towards tourists they perceive as being rich and reckless. Speaking Spanish will help, as will being kind and patient. If your car breaks down, pull it alongside the road if possible. Your trunk should have reflecting triangles for you to place behind your vehicle to warn approaching traffic. Call emergency services and wait until they arrive. Some types of rental insurance covers breakdowns and have roadside assistance; some do not. Be sure to check your policy before leaving the rental office. 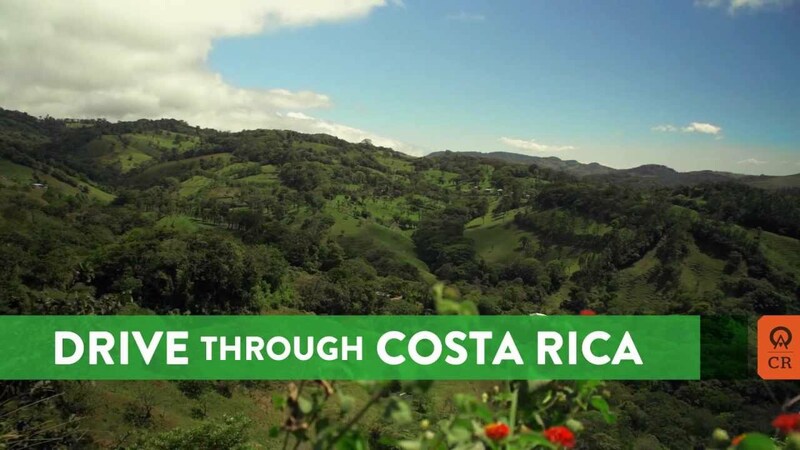 Although Costa Rica is relatively small, the driving time between destinations can be long. Again, this is largely a result of the country’s poor road system. With this in mind, it’s advisable to plan on trips taking longer than you may have expected. As a general rule, expect to travel at a rate of 50 km/h (31 mph). For example, if you have to drive 250 kilometers (155 mi. ), you should plan on it taking around five hours. And remember, Costa Rica uses kilometers, not miles. One kilometer equals 0.62 mile. Costa Rica is a friendly country, but there are still thefts. For this reason, always lock your car when it’s parked and avoid leaving valuables inside. If a camera, purse or wallet is sitting on the seat, you’re encouraging thieves to break in and steal your stuff. In large cities like San José, Alajuela, Limón and Puntarenas this is especially true. When parking in these cities, try to leave your car in a secure lot with an attendant. Rural areas can, however, experience break-ins as well—lock your car and leave expensive or important items at your hotel. As with most things, if you exercise common sense and caution, you should be fine. The last thing anyone wants to deal with while on vacation is a traffic ticket (or worse, jail). Costa Rica’s driving laws are sensible and straightforward. If you exercise caution and drive smartly, you will be fine. The following points will help you understand Costa Rica’s most relevant driving laws. Driving under the influence of alcohol or drugs is taken seriously. Driving with a blood alcohol concentration (BAC) between 0.05 and 0.074 is considered under the influence. The fine is approximately $550. Driving with a BAC higher than 0.075 will result in prison. As you can see, Costa Rica’s driving laws are similar to most other countries. The key things to remember include wearing a seatbelt, having your driver’s license handy, not speeding, not talking on the phone, not driving under alcohol or drugs influence, and always using a child’s seat for children under the age of 12. By familiarizing yourself with these laws and being a cautious, defensive driver, you should not have any legal problems while driving in Costa Rica. This map shows the rental locations for all of Costa Rica. Renting a car in Costa Rica has the potential to create a very unique trip for travelers. You can seek out little-known places, stop when you want, and craft your own adventure from scratch. However, driving in Costa Rica is serious. Road conditions can be difficult and driving times can be long. Before getting behind the wheel, think about what it requires and how you want your trip to unfold. Your experience in Costa Rica will be fantastic no matter what direction you steer your adventure. Ask an Anywhere agent about your questions and concerns on renting a car in Costa Rica!